COSC Testing (Contrôle Officiel Suisse des Chronométres) is carried out by the Official Swiss Chronometer Testing Institute, the body responsible for certifying the accuracy and precision of Swiss timepieces, which have an exceptionally high standard of time-keeping. COSC testing assesses the accuracy of a watch’s movement. If the timepiece is of a high standard of accuracy and precision, it will be certified as a “chronometer” watch (from the Greek “chrónos”, meaning time, and “métron”, meaning measure). COSC is the only body able to issue a chronometer certificate for the accuracy of a watch’s time-keeping. The basic level of precision that must be reached for a standard men’s watch is an accuracy within -3 and +6 seconds of variation per day over a period of 15 days (in a range of functioning positions and at varying temperatures). The chronometer certificate is highly-coveted at the top end of the watch market, despite the high cost of the COSC tests performed. There are two types of chronometer certificates that can be issued. 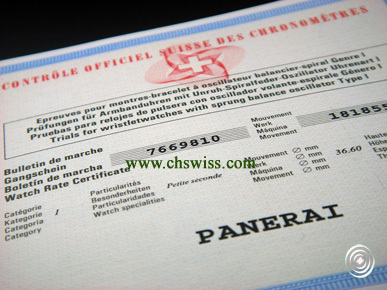 The first is a certificate stating that the watch has successfully passed all the chronometer tests. The second is a certificate that gives a detailed breakdown of the test results. However, as the latter is more expensive, it is not requested as often as the first type of certificate, as it can affect the final price of a watch. 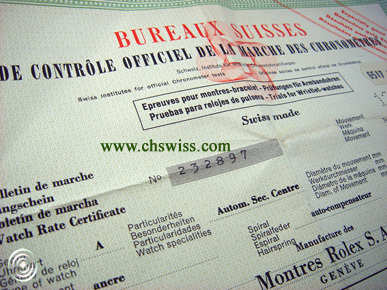 In the watch market, the official COSC chronometer certificate greatly increases the prestige and reputation of a watch, essential qualities in the market of fine watch-making.